Emma Booysen sent in more photos documenting species at Aliwal Shoal. One was a new distribution record for Aliwal. The adult yellowspotted kingfish, Carangoides fulvoguttatus was previously known to Durban, with juveniles to the Eastern Cape. Emma’s photograph (above) doesn't show the golden spots that are found on the upper body, but the shape of the head and black spots (there can be 2-5) in a mid-lateral row towards the back of the body indicate that these are large adults. We were sent the photograph below of a 80 cm pike conger Muraenesox bagio taken by Stiaan Conradie of the Lower Breede River Conservancy in the Western Cape (south of Mossel Bay). 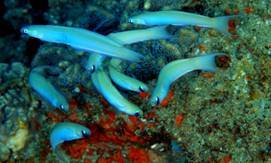 This Indo-Pacific species, the only pike conger in our area, was previously known south to Knysna. Pike congers are golden-brown to grey dorsally, pale below, with the lateral line a series of white dashes. Their posterior nostril is a simple hole, they have pectoral fins and the dorsal fin starts above the gill opening. The photograph shows the single row of blade-like teeth on the vomer of the upper jaw and a mouth extending past the eye. Pike congers are good eating and commercially important in India and southeast Asia. They attain 180 cm and adults are found offshore on the bottom. This is a fish with attitude and fishermen should take care when landing one. A juvenile Moorish idol Zanclus cornutus was found washed up on the beach at Franskraal near Gansbaai, Western Cape by Jan Venter. This is an Indo-Pacific fish and adults are known to Aliwal Shoal. Juveniles have been found as far south as the Breede River so Franskraal represents a range extension for juveniles. This summer many juvenile Moorish idols have been found along the Eastern Cape coast, particularly in Algoa Bay. The wide distribution from Africa to Mexico is attributed to the long duration of the pelagic postlarval stage. This fish is a tiny juvenile (it has lost the stout curved preorbital spine found below each eye on the postlarval stage). Moorish idols are common on coral reefs, also in harbours near wharves and pilings. The juvenile Moorish idol, Zanclus cornutus found on the beach at Franskraal. Photograph by Jan Venter. The monofin dart-goby Ptereleotris monoptera photographed at Sodwana Bay by Dennis Polack (above) and Sally Polack (below). Last year we sent out a colour plate and text on the dart-gobies of southern Africa. Sally and Dennis Polack and John Dench sent in photographs of the monofin dartgoby Ptereleotris monoptera, a species which we had not included. This tropical Indo-West Pacific species was known from the Seychelles, Oman and Chagos Archipelago and is now reported as a new record for Africa and South Africa (Sodwana Bay). This dart-goby gets its common name and scientific names from its single dorsal fin (all the other species in our area have 2 dorsal fins). It has no chin barbel and has an emarginate tail fin with pointed lobes elongated into filaments in adults. The body is pale yellowish to greyish blue with a broad blue area over the abdomen and a diffuse blackish bar from the eye to underneath the chin. 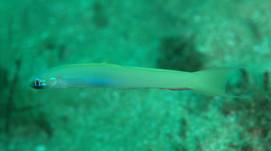 Monofin dart-gobies attain 107 mm SL. They sometimes form loose schools, seeking refuge in burrows in the sand or among coral rock in depths of 6—15 m.